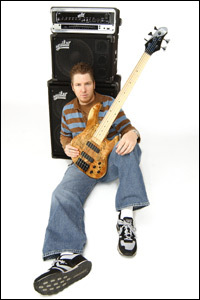 Utilizing a repertoire of innovative arrangements and contemporary techniques, Ray Riendeau has showcased his virtuoso bass playing ability on four discs including All Funked Up, Groove Therapy, Enlightenment, and Arrhythmia that he has released through his Groove Theory Records label. Before Rob Halford left to rejoin Judas Priest in 2003, Riendeau recorded two studio projects, a live double CD release, and toured around the world with the Priest frontman as a member of the band Halford. Besides his work with Halford, Riendeau is acknowledged for his contributions alongside highly-revered guitarists such as Gary Hoey, Greg Koch, and Neil Zaza. While a member of Machines of Loving Grace, Riendeau played on the movie soundtrack of "The Crow" which sold over one million units. Riendeau's playing has also been featured in a number of commercial ads for Fox TV, MTV, United Artists, and Disney. 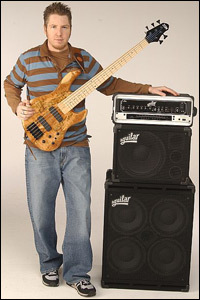 As a clinician, Riendeau has demonstrated his concepts to students throughout the United States at events such as Bass Day - L.A., the National Guitar Summer Workshop, Bass Day - New York, and the School of Bass. Riendeau has also assisted in the research and development of Sunn bass amps and Fender series combo amps for Fender Musical Instruments. In the following interview, Riendeau discusses his recordings as a solo artist, his advanced slap bass techniques, and dealing with discouragement as a musician. Can you tell us about your 4 recordings as a solo artist? Each time I do a solo project, I try to do something different and in-the-moment. My first CD, All Funked Up, is one of my favorites because it's all bass and drums. Every song on that recording was a solo piece prior to teaming up with Joe Morris on drums. I actually need to make more copies of that CD because they sold out pretty quickly from all the clinics I was doing at the time. My second disc, Groove Therapy, has more instrumentation and is a mixture of a lot of various things I was working on during that period. The title track is one song that I'm very proud of compositionally, and the bass parts are pretty insane. Enlightenment is a recording that I did for LightWave Systems, an optical pickup company. They wanted some music that was made using a bass with their pickups, and I thought it would be cool to do some solo pieces using their technology. The optical pickups allow you to pan, effect, and mix each string discreetly. The downside, for me, was that I recorded the CD in just two days! Some of the pieces weren't as polished as I would have liked, but on the other hand, it has a very raw sound, and I'm proud of how it came out under the circumstances. 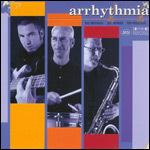 The latest project, Arrhythmia, was more of a band effort that included Joe again on drums along with saxophonist Ted Belledin. This CD was different than all the previous ones in that we spent a lot more time writing ideas rather than just jamming. I also included more of my fingerstyle playing along with the usual slap acrobatics. All in all, I'm proud of every CD. Each one of them was recorded at the Conservatory of Recording Arts and Sciences here in Phoenix. Joe is the musical director so we got free studio time. The only drawback was that everything we recorded was done under severe time constraints and was live, meaning we didn't use Pro Tools to fix things. We got one or two takes to get it right before we had to move on. I think the recordings reflect this, and I like that they have a very raw, visceral quality to them. What have you been up to since releasing your last recording as a leader in 2002? Musically, I haven't done much. I took some much needed time off from the music business. After doing the last few Halford shows before Rob's departure to reunite with Judas Priest, I just made a decision to take a break from touring. I also really needed a break from music. Are you working on any new musical endeavors? Currently, I'm just doing a lot of playing and writing again. I still love the slap style of bass playing, and I really enjoy creating new grooves and pushing the style to its limits. Taking some time off from playing has really helped me come up with some fresh and new perspectives. I've been trying to incorporate more of the linear slap style into my vocabulary as well. I have been asked to participate in the second School of Bass this October here in Arizona. The lineup this year includes Tim Bogert and Bobby Vega. The first School of Bass was a huge success, and I look forward to doing it again this year. Do you have plans for another solo project? I'm sure at some point in the future I will want to document the new ideas I'm currently working on. How has your style and approach to playing bass evolved since your first recording? Stylistically, I think I have a pretty unique approach and sound to the slap style. The evolution really started many years ago by studying the music and learning the traditional methods of the slap style from bassists like Larry Graham, Louis Johnson, and Stanley Clarke. I also got inspiration from the newer generation of bassists such as Victor Wooten and Marcus Miller. I just keep trying to elevate my approach by incorporating more complex rhythms along with being able to apply slap techniques to more advanced harmonies. Necessity is the mother of invention, and a lot of what I do comes from experimentation. By working out how to facilitate certain rhythms and harmonies on bass, my playing has just evolved into my own sound and style. When you were first learning to play bass, what were some of the concepts that really expanded your playing and helped you develop a unique voice on the instrument? Theory, theory, and more theory! Once you learn how music works and how to navigate the bass with notes, scales, and harmony, you have the tools to create. Studying other people's styles and approaches is great and a big part of building a vocabulary, but as far as having your own voice, you ultimately need to create it by doing a lot of writing, improvising, and so forth. Understanding theory gives you the tools to create music. Using your advanced slap techniques, how do you typically come up with new bass lines? I think the best advice I can give here regarding bass line construction is that when you are working on a new musical concept, idea, or technique, the best way to add it to your vocabulary is to use it musically. Everything should be made into music. Some of my best tunes and grooves started out as exercises to integrate whatever idea or technique I was working on at the time. Right now, I'm interested in getting better at incorporating more linear slapped bass lines into my vocabulary so I've been writing a lot of grooves that utilize them. The more I play the grooves, the better I become at using the techniques, and I am also adding more grooves to my vocabulary at the same time. Another method I like to use to create bass lines is through taking a song or piece of music that is not typically slapped and work out how I could play it using slap techniques. This is a great approach to conceive new ways of navigating through a composition using only slap techniques. How do you choose the cover tunes that appear on your recordings? First, the piece of music obviously has to be a song that I like! I enjoy the challenge of taking a song and creating an arrangement for solo bass. Sometimes it works well, and sometimes it doesn't. I don't like to limit myself to using a certain technique, and in fact, I use anything and everything that assists me in playing the arrangement. At the core, I try to maintain the groove or feel of the song while implying the harmony and melody. It can be a considerable endeavor, but when it works, you experience an enormous sense of accomplishment. Even the cover tunes that have overdubbed bass lines started out as versions I could play as solo pieces. Have you ever considered outlining your techniques either through an instructional video or book? I have but every time I think of all the work it would take, I loose interest. If students want to some take lessons, how would they go about setting that up with you? If you are in the Phoenix area and would like to setup some lessons, please contact me through my website. Which other musicians inspire you? Anyone who is sincere in the music they make is inspiring to me. Music is art and subject to many opinions of likes or dislikes, and that's what makes it interesting. Having integrity in what you do is inspiring in all aspects of life and certainly music. Do you have any advice for what someone might do in order to overcome discouragement and the obstacles of the music industry? I'll tell you, music is a labor of love. This is a hard way to make a living. I've been very fortunate to do all I've done as a bass player. It took a ton of hard work and even more luck. This is a great question for me because the reason I had to take time off from music was that it started not being fun for me anymore. I was scared that if I didn't take a break and get back to why I started playing in the first place that I might end up quitting all together. The "biz" of music just started wearing on me. My advice is to never loose sight of why you play, because you enjoy creating and performing music! When your musical identity becomes more about percentages, endorsements, money, and so forth and not about the playing, it can destroy you as a musician. It's certainly a good thing to aspire to "make it" in the music industry, but never loose sight of the gift of music itself.